'Color Guard' Stands at Attention | Faddegon's Nursery, Inc.
May 25, 2016 | Shrubs, Trees & Vines, What's New? 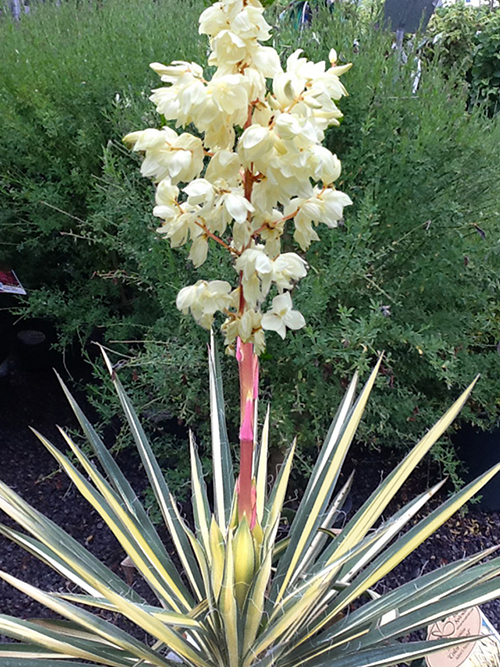 Yuccas are one of the most unusual and dramatic garden plants you will ever see. Sword-like foliage fans outward reaching 2 to 3 feet and persisting year round. In spring, a sturdy flower stalk rises several feet from the center of the plant blooming in early to mid summer with creamy white bell shaped flowers. Yuccas are reminiscent of desert plants in their habit – relatives in the genus are native to the Southwest. Tough as nails on the outside only to reveal beautiful romantic looking flowers! Maintenance is not an issue. Yuccas take care of themselves. They’re not picky about site either. They love dry sandy soil making them a great solution for a site that other large bloomers won’t tolerate. Heat and drought tolerant once established. ‘Color Guard’ is a variegated selection with yellow stripes racing up the centers of the leaves bringing even more visual interest to the garden. In cooler weather you’ll notice ‘Color Guard’ go through a color change! The leaf margins acquire a pinkish glow while the center yellow stripe turns a rosy color.